Computer Arts 112. Art of Web Design Issue. - The very best new work from the global design community. - Incisive opinions from the design world’s thought leaders. High quality glossy magazine focusing on architecture and interior design. Magazine is in very good condition. Society of Industrial Artists & Designers. July/Aug 1975. DESIGNER magazine. For sale is THE WORLD OF INTERIORS magazine from July 1990. 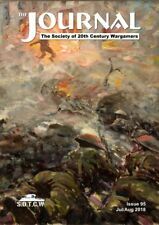 The magazine is complete and in very good condition for its age. Typography Issue. Computer Arts 86. Plus dust jacket. - The very best new work from the global design community. In every issue, you'll find. CLINT MAGAZINE #9 JULY 2011 MARK MILLAR, COMICS! All comics bagged and boarded. Price : 4.10. CLINT MAGAZINE VOL 2 #2 JULY 2012 MARK MILLAR, COMICS! 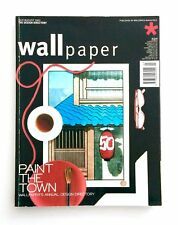 WALLPAPER* Magazine No #50 JULY / AUGUST 2002 Piero Fornasetti HENRY KLUMB Rare! Henry Klumb. Piero Fornasetti. A rare back issue of the ever-inspiring Wallpaper magazine. July / August 2002. Very good condition : Light surface- and edge wear to the covers only, internally the magazine is pretty much pristine. THE WORLD OF INTERIORS MAGAZIN E JULY 2010. EXCELLENT CONDITION. MAXINE WEBSTER. PAUL ARDEN. NICK KNIGHT. CREATIVE REVIEW Magazine, July 1988. IN THIS ISSUE. Night Raid on the Aragon Front –A smallmilitia scenario for the SCW. French Counter-attack at Kuneitra –Syria,15/16 June 1941. Revolutionary Militias of the Spanish Civil War. A Miscellany of Morgan. Out of theBlue –An SAS Scenario in the Desert. Used, good readable condition, may exhibit light marking from storage/reading. For sale is the LEISURE PAINTER magazine from July 2006. The magazine is in very good condition. For sale is a brand new copy of Grand Designs magazine - July 2011. This comes from a smoke and pet free home. For sale is a brand new sealed copy of Grand Designs magazine - July 2012. This comes from a smoke and pet free home. MAGGIE GYLLENHAAL BY MIGUEL REVERIEGO ON THE cover. DAZED & CONFUSED MAGAZINE, VOL II #51, JULY 2007. AND MANY MORE. · MARK MOTHERSBAUGH. model : AYKEL SOKER & VIKA KUROPYATNIKOVA. photographer : KARIM SADLI. The Artist's & Illustrator's magazine in excellent condition. Has been kept in the loft for many years and is why the condition is so good. The Artist magazine in excellent condition. Has been kept in the loft for many years and is why the condition is so good. The Value of Copying. Drawing and Painting Skies. Landscape Textures in Watercolour. The Artist magazine in excellent condition. Has been kept in the loft for many years and is why the condition is so good. The Exhibition. Flower Collages from the Masters. Sand Painting for the Artist-Craftsman. The Artist magazine in excellent condition. Has been kept in the loft for many years and is why the condition is so good. Master Classes in Acrylics. The Mixing of Colours. Painting My Animals. Augustus John Was Here. The Artist magazine in excellent condition. Has been kept in the loft for many years and is why the condition is so good. The Artist's Gallery Guide. The Art of the Self-taught. Making the Annual Pilgrimage to Burlington House. For sale is the LEISURE PAINTER magazine from July 2004. The magazine is in very good condition. The Artist magazine in excellent condition. Has been kept in the loft for many years and is why the condition is so good. Ingres and the Classical Tradition. The Intimate Mural. Godfrey Pilkington: Arbiter of Taste. The Artist magazine in excellent condition. Has been kept in the loft for many years and is why the condition is so good. Edinburgh and the Border. Talking Pictures. Henry Lamb 1883-1960. Heat and Dust. If there's a problem with your order get in touch. Here at Pinstripe Distribution Limited, Money Wise. Once we have received your request we will then send you a unique authorisation code. Any order received before. How long will it take to get my item?. THIS IS A FLEXIBLE BACK PUBLICATION TITLED " THE STUDIO " THIS HAS OVER 40 PAGES OF VERY GOOD READING ALONG WITH COLOUR PLATES. A NICE PUBLICATION IN USED CONDITION. Once we have received your request we will then send you a unique authorisation code. Here at Pinstripe Distribution Limited, Money Wise. Here at Pinstripe Distribution Limited, Money Wise. THIS IS A FLEXIBLE BACK PUBLICATION TITLED " THE STUDIO " THIS HAS OVER 35 PAGES OF VERY GOOD READING ALONG WITH COLOUR PLATES. A NICE PUBLICATION IN USED CONDITION. Vol CXLII No 3960. CARPENTER & BUILDER. 24 JULY 1953. THE ILLUSTRATED. THE LARGEST CIRCULATION IN THE BUILDING INDUSTRY. TO THE BUILDING INDUSTRY. All our magazines are in sealed in plastic bags. They are sent in hardback or bubble wrap envelopes. Vol CXLI No 3908. CARPENTER & BUILDER. 25 JULY 1952. THE ILLUSTRATED. THE LARGEST CIRCULATION IN THE BUILDING INDUSTRY. TO THE BUILDING INDUSTRY. ART & ANTIQUES WEEKLY MAGAZINE. July 15, 1972. See photograph for content of Magazine. Vol CXLII No 3957. CARPENTER & BUILDER. 3 JULY 1953. THE ILLUSTRATED. THE LARGEST CIRCULATION IN THE BUILDING INDUSTRY. TO THE BUILDING INDUSTRY. Vol CXLII No 3959. CARPENTER & BUILDER. 17 JULY 1953. THE ILLUSTRATED. THE LARGEST CIRCULATION IN THE BUILDING INDUSTRY. TO THE BUILDING INDUSTRY. Vol CXLII No 3958. CARPENTER & BUILDER. 10 JULY 1953. THE ILLUSTRATED. THE LARGEST CIRCULATION IN THE BUILDING INDUSTRY. TO THE BUILDING INDUSTRY. Here at Pinstripe Distribution Limited, Money Wise. Once we have received your request we will then send you a unique authorisation code. How long will it take to get my item?.